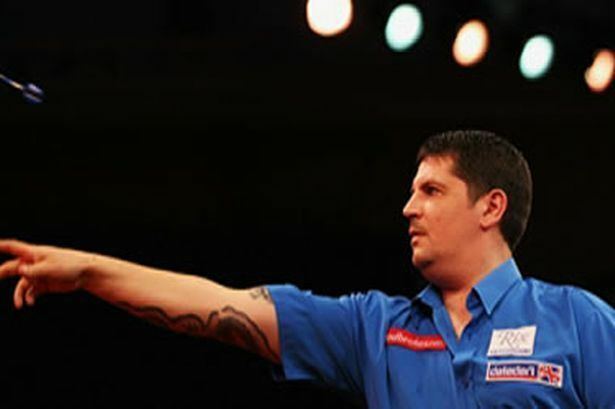 Gary Anderson (born 22 December 1970) is a Scottish professional darts player from Eyemouth, Scottish Borders, currently playing in the Professional Darts Corporation, and a former BDO and WDF world number one. He is also a two-time PDC World Champion having won it in 2015 and 2016 and is nicknamed the Flying Scotsman. Anderson is renowned for his heavy scoring in the game and having one of the smoothest throws. Anderson is a two-time back-to-back PDC World Champion after defeating Adrian Lewis 7–5 in the 2016 final, while he was also a finalist in 2011 and 2017. His other career highlights include winning the International Darts League in 2007, the World Darts Trophy in 2007, the Zuiderduin Masters in 2007 and 2008, the Premier League in 2011 and 2015 and the Players Championship Finals in 2014. Between the BDO and PDC, Anderson is a nine-time major winner. Touted as a future world champion long before his 2015 world title win, Wayne Mardle said of Anderson as someone when he is hitting his doubles "Nobody can live with him when he does that. 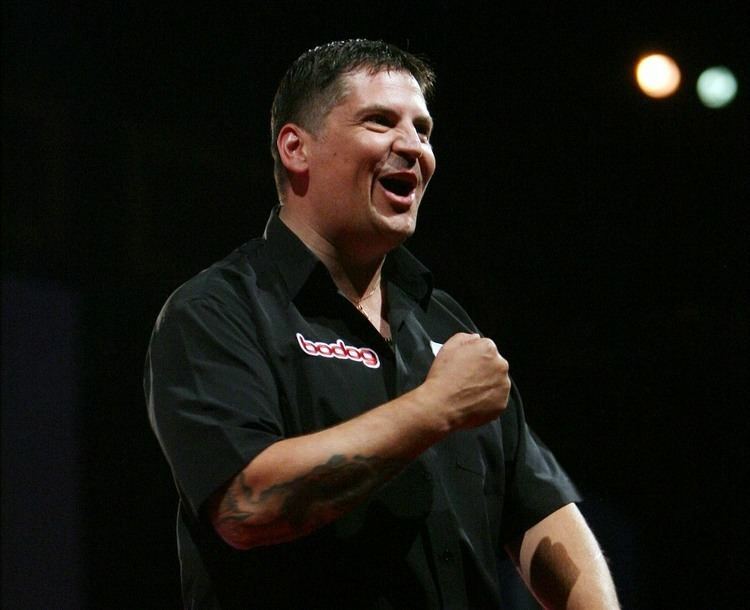 Whether you’re world champion or world No 1, you will get beaten by Gary Anderson." Anderson began his career playing in British Darts Organisation events and won the second tournament he entered by claiming the 2001 Welsh Open with a defeat of John Walton. The win ensured he qualified for the following year's World Championship for the first time, where he suffered a first round defeat to Sweden's Stefan Nagy, going down 3–0. The following year, in the 2003 BDO World Darts Championship Anderson reached the semi-final stage before bowing out to eventual runner-up Ritchie Davies. Anderson would not win another match at the Lakeside Country Club until 2006, when he beat Gary Robson in the first round before again falling to the eventual finalist this time in Raymond van Barneveld in the second round. In the following two years, Anderson was knocked out of the World Championship in the first round by Dutch players - in 2007, he lost to Albertino Essers, and in 2008, he was defeated by Fabian Roosenbrand. Anderson won the first major tournaments of his career by claiming the International Darts League and World Darts Trophy back-to-back in 2007. It was a significant achievement as he succeeded against fields comprising the top players and world champions from both the rival organisations: the Professional Darts Corporation and BDO. In the two events, he had victories against Wayne Mardle, Roland Scholten, Mervyn King, James Wade, Adrian Lewis, Mark Webster, John Part, Peter Manley, Andy Hamilton and Phil Taylor. Shortly after his WDT title, his success continued by clinching the BDO British Open to add to his 2007 Scottish Open success. Anderson also won the Zuiderduin Masters two years in a row - the first of which was an unranked event, the second was the first championship since the tournament was elevated to the status of ranking major. Anderson finished 2007 as the WDF world number 1, while he later ended 2008 as the WDF world number 2 behind Scott Waites In 2008, Anderson won the German Open, Welsh Open and BDO International Grand Prix titles. He also won the Dutch Pentathlon in 2008, retaining the title in 2009, with a world record score of 502 points. Between 2000 and 2008, Anderson represented Scotland at three WDF World Cups, four WDF Europe Cups, and five Six Nations Cup. With Scotland, Anderson lifted successive Six Nations Cups in 2002 and 2003, as well as winning the WDF Europe Cup four-man and overall team titles in 2002. In total, Anderson played thirty-two matches for Scotland, winning twenty-two of them. After losing to Tony O'Shea in the quarter-finals of the 2009 World Championship, Anderson threw his darts into the lake near the Lakeside Country Club. After months of speculation, Anderson joined the PDC in early 2009. He made his PDC televised debut in an exhibition match at the Premier League Darts meeting in Cardiff, after Wayne Mardle had withdrawn with illness, and defeated John Part with a three-dart average of 107. He then qualified for the 2009 UK Open at the Reebok Stadium in Bolton, losing in the second round 6–4 to Paul Nicholson. On his PDC World Championship debut in 2010, Anderson defeated Jamie Caven 3–2 in the first round before losing 4–0 against Ronnie Baxter in the second round. In June 2010, Anderson reached his first ever PDC major final at the UK Open. He defeated Michael van Gerwen, Paul Nicholson, Mervyn King (who hit a nine-dart finish against Anderson), Andy Hamilton, and Tony Ayres before losing to Phil Taylor in the final 5–11. At the 2010 World Matchplay he produced the first whitewash for six years with a 10–0 thumping of fellow Scot Robert Thornton during their first round encounter. His second round encounter was against Jelle Klaasen, with Klaasen winning 15–13. Anderson qualified for the 2010 Grand Slam of Darts, and went into the tournament as the number six seed. Anderson defeated Mark Hylton, Mark Webster and Wayne Jones in the group stage to finish top of his group. In the second round he defeated Colin Osborne 10–3 to again play Jones in the quarter finals. Anderson led 15–12 before Jones took the last four legs to win the match 16–15. Anderson represented Scotland along with Robert Thornton for the inaugural PDC World Cup of Darts in 2010 PDC World Cup of Darts. They entered the tournament in the second round as 4th seeds and beat Russia, paired by Anastasia Dobromyslova and Roman Konchikov, 6–2 to advance to the group stage, where they lost their opening group game to Wales pairing Mark Webster and Barrie Bates. Having recovered to secure victory against Bill Davis and Darin Young of the United States, Anderson and Thornton went out after defeat to Spain's Carlos Rodriguez and Antonio Alcinas. Anderson qualified for the 2011 World Championship as the number 11 seed and in the first round played Japan's Morihiro Hashimoto. Anderson won 3–0 in sets, taking all nine legs without reply, with an average of 103.23. In the second round he faced two-time world champion Dennis Priestley, winning 4 sets to 2. He then defeated Andy Smith in the third round (whilst setting his highest World Championship average of 108.39), Raymond van Barneveld in the quarter-finals, and Terry Jenkins in the semi-finals to ensure his place in the final against Adrian Lewis. Anderson was defeated 7–5 by Lewis, who also hit a nine-dart finish during the first set of the match. Despite the loss, Anderson's run ensured him a place in the 2011 Premier League as he had moved into the top four on the Order of Merit. Anderson was the number two seed for the 2011 Players Championship Finals, and reached his second successive major final, where he played Phil Taylor. Anderson led 11–9, but Taylor checked out 128 in the deciding leg to win 13–12. In the Premier League he got off to a winning start by beating Simon Whitlock 8–5 on the opening night at the O2 Arena. He went on to win his first four games before losing to Taylor in week five. Anderson finished the group stage in third place and played Van Barneveld in the semi-finals, winning 8–6. In a repeat of the World Championship final he played Lewis (who had beaten Taylor 8–3 in the other semi-final) and beat him 10–4 to win his first major championship in the PDC, his third in total, and his first in the UK having had his previous successes in the Netherlands. In the World Matchplay he was beaten 10–6 in his first round match against Andy Hamilton, and he lost in the second round of the European Championship 10–5 to Peter Wright. Away from the television cameras on the PDC Pro Tour he won four Players Championships during the year including both during the same weekend in Nuland. In the first round of the World Grand Prix he faced Richie Burnett and lost 2–1 in sets. Anderson qualified from Group C of the Grand Slam of Darts and then won through to the final where he met Taylor and was comfortably beaten 16–4. Anderson holds the record for the highest ever three dart average in darts history in an official tournament with a 133.35 average in a 6–1 win against Arron Monk in a UK Open Qualifier during 2011. Anderson survived a huge scare in the first round of the 2012 World Championship as his opponent Jyhan Artut had four darts to win the match. He missed and Anderson won the match 3-2 on a sudden-death leg. He used his lucky escape to his advantage by defeating Devon Petersen and Colin Lloyd, 4-2 and 4-1 respectively, to set up a quarter-final clash with Simon Whitlock. He won the first set of the match, but missed a total of 29 darts at a double and lost 1-5. He played in his second World Cup for Scotland in February, this time with Peter Wright and together they were beaten by South Africa in the second round, losing in a sudden-death leg. Anderson had a disappointing defence of his Premier League title. He finished bottom of the league table having won just three matches from the 14 game season. In winning the event in 2011 he made a total of 79 180's, but could only manage 31 this year, the least of any of the eight players. However, in the last league game Anderson did have an encouraging 7–7 draw with Phil Taylor. In June, he completed his first live televised nine-dart finish in a 9–3 third round win over Davey Dodds at the UK Open. He lost in the next round to compatriot, and eventual winner of the event, Robert Thornton 7–9. He was then forced to take a month away from the sport due to problems focusing with his left eye, returning to play in the World Matchplay. There he played Dean Winstanley in the first round and, despite leading 5–0, lost the match 11–13. Anderson was banned by the Darts Regulation Authority for two European Tour events and the European Championship due to "him failing to complete his match and his subsequent behaviour" at the European Tour Event 2. In October, he lost in the final of the 14th Players Championship of the year, 5–6 to Robert Thornton in an all Scottish final. Anderson then won the non-ranking Irish Masters by beating Colin Osborne 6–1 in the final. He finished second in Group F of the Grand Slam of Darts to qualify for the last 16, where he faced Andy Hamilton. Despite averaging almost 102, Anderson lost 9–10 in a thrilling match. After all 33 ProTour events of 2012 had been played, Anderson was 26th on the Order of Merit, inside the top 32 who qualified for the Players Championship Finals. He saw off Wes Newton and Robert Thornton, but was then beaten 8–10 by Simon Whitlock in the quarter-finals. Anderson survived three match darts versus John Bowles in the second round of the 2013 World Championship to win in a deciding set, but was then comfortably beaten by Raymond van Barneveld 0–4 in 33 minutes as he missed a total of 23 darts at doubles. Because the ranking system works as a two-year rolling list based on prize money earned, Anderson lost the £100,000 from reaching the 2011 World Championship final and dropped to world number 11 after the tournament. Anderson partnered Robert Thornton for the third time at the World Cup of Darts and they were shocked by Spain 4–5 in the last 16. He threw a nine-dart finish in the third UK Open Qualifier during a first round win over Josh Payne, but lost in the following round 5–6 to Michael van Gerwen. He qualified for the 2013 Premier League by virtue of being the 2011 champion. In the first eight matches he could only beat Phil Taylor and Simon Whitlock and went into the ninth week knowing he had to beat James Wade to have any chance of avoiding being one of the two relegated players from the 10-man league. Anderson lost 3–7 to Wade and stated afterwards that he has struggled with his game for the last year. At the UK Open he led Kevin Painter 7–3 in the fourth round, but then lost six consecutive legs to exit the tournament 7–9. Anderson showed his best darts in the first round of the World Grand Prix as he averaged 104.86 in the double start event during a two sets to nil 10 minute defeat of Jelle Klaasen. He then edged past Wes Newton 3–2 before meeting Phil Taylor in top form in the quarter-finals who beat Anderson 3–0. At the Grand Slam of Darts, Anderson produced two superb performances in the group stage as he averaged 107.14 and 111.80 in defeats of Wesley Harms and Peter Wright. He lost his other game to James Wade to finish second in the group and play Taylor in the last 16. Anderson again posted an impressive average of 106.13 (almost four points ahead of Taylor's), but from 4–4 was unable to capitalise on the chances his scoring set up and lost 10–5. Anderson's second major quarter-final of the year came at the Players Championship Finals where he lost 9–7 to Justin Pipe. Anderson comfortably beat Mark Dudbridge and Brendan Dolan in the 2014 World Championship to face Michael van Gerwen in the third round. He took advantage of a sluggish start from Van Gerwen to establish a 3–1 lead and also missed two darts to win the set he lost. However, Anderson's usual scoring power deserted him as he lost three sets in a row to exit the tournament. Anderson bemoaned the fact that he had been playing consistently well over the previous months but kept losing games he should win through silly mistakes. He then began the year by claiming his first ranking title in two and a half years at the German Darts Championship. Anderson recovered from 5–3 down to Justin Pipe in the final to win 6–5, surviving six match darts from his opponent in the process and said afterwards his goal for the year was to reclaim his ranking in the top eight. His good start to the year continued as he won the fifth UK Open Qualifier with a 6–2 defeat of Robert Thornton. At the UK Open itself he lost 9–7 to Ian White in the fifth round. Anderson's third title of the year came at the first Players Championship as he averaged 111.47 in beating Andrew Gilding 6–5 in a high quality final. Another tournament victory came a week later at the third event by edging out Phil Taylor 6–5, with Anderson describing afterwards that winning has become a habit again. Anderson received a Sky Sports wildcard to participate in the Premier League this year. He had a fantastic second half of the season to win five of his last seven matches, drawing the other two, to finish fourth in the table and qualify for the play-offs. Anderson played Van Gerwen in the semi-finals against whom he lost to 7–5 and beat 7–4 during the league stage. There was never more than a leg between the players throughout the whole match with Van Gerwen throwing for it in the deciding leg. He kicked off with a 171 and Anderson could only reply with 17 and went on to lose 8–7. With doubling so often the weakness in Anderson's game, he managed to hit 43% during the whole season this year, the third highest out of the ten players. In June he won his fifth title of the season at the 11th Players Championship with a 6–2 defeat of Thornton. At the World Matchplay, Anderson beat Jamie Caven 10–8 and Stephen Bunting 13–8 (whilst averaging 104.41) to progress past the second round for the first time in his sixth appearance in the event. In the quarter-finals he outplayed Adrian Lewis in winning 13–8 and was then involved in a high quality match against Phil Taylor in the semi-finals as both players averaged 105 which Anderson just lost 17–15. Anderson stated that the quality of his darts was beginning to scare other players again and his successful week took him back into the world's top 10. In September he averaged 115.62 in thrashing Lewis 6–0 in the semi-finals of the 13th Players Championship and then fought back from 5–3 down in the final against Richie Burnett to take the title 6–5. He also reached the final of the 16th event but lost 6–2 against Brendan Dolan. Anderson's successful season in the floor events concluded at the final Players Championship where he sealed the title by throwing a 10 dart leg to edge Peter Wright 6–5. He finished the season top of the Pro Tour Order of Merit and was therefore the number one seed for the Players Championship Finals, something Anderson said he had worked his heart out all year to achieve. He produced his very highest standard throughout the event beginning with a 6–5 win over Christian Kist with an average of 110.62. In the quarter-finals he beat Taylor for the first time since 2007 in a televised knockout match and then eliminated Vincent van der Voort 11–7 and Lewis 11–6 in the final. It was Anderson's fourth major title and he ended the tournament with an overall average of 104.72. Anderson seemed to become frustrated with his first round opponent Scott Kirchner's playing style at the 2015 World Championship. Kirchner threw an imaginary dart before every visit to the board and Anderson struggled to a 3–1 win averaging 86.20. A much higher quality match followed against the fast throwing Jelle Klaasen in which Anderson recovered from 3–1 down to win 4–3, taking out a crucial 84 finish on the bull in the fifth set with Klaasen waiting on 89 for the match. Both players averaged over 100 with 20 180s thrown. More comfortable victories followed over Cristo Reyes (averaged 104.54) and last year's finalist Peter Wright (averaged 102.12) to set up a semi-final tie with Michael van Gerwen. Just like their meeting in the third round of 2014's event, Van Gerwen recovered from a 3–1 deficit to level at 3–3. However, he would miss four darts to gain a set lead for the first time in the match, with Anderson going on to take it 6–3. He finished with a checkout rate of 50% and averaged over 100 for the fourth game in a row. Anderson held an early 3–1 advantage over Phil Taylor in the final, before the 16-time world champion won nine of the next ten legs to move 4–3 ahead. Taylor then missed three darts to take the next set, allowing Anderson to tie the scores at 4–4. In Anderson's first visit to the board at the beginning of the ninth set he hit two treble 20s, but his third dart knocked them out of the bed to score nothing. He lost the leg and became distracted by a member of the audience shouting out to be two legs down, before punishing more missed darts from Taylor to claim the set. Anderson stood one set away from the title when he made it 6–4, but Taylor quickly recovered to send the match into a deciding set. Taylor had three darts to hold his throw in the second leg, but could not find the target as Anderson took the final set without reply to win his first World Championship 7–6. The match broke the record for 180s in a PDC final with 32, beating the 31 thrown during the 2007 final. Anderson's total 180s during the whole tournament of 64 was also a record. The title saw him climb to world number three, his highest position to date. Later in the month he was crowned the PDC Player of the Year, Pro Tour Player of the Year, Fans' Player of the Year and Players' Player of the Year at the annual awards dinner. At the Masters, following wins over Andy Hamilton,10–2, and James Wade,10–5, in which Anderson averaged 121 in the first five legs, he lost 11–6 to Raymond van Barneveld in the semi-finals. Anderson began his Premier League campaign with a 7–5 win over Phil Taylor. He was beaten 6–2 in the final of the German Darts Championship by Michael van Gerwen. From 8–4 ahead of Mervyn King in the third round of the UK Open, Anderson missed a total of 13 match darts to be defeated 9–8. In week six of the Premier League, Anderson secured a superb 7–1 win over Adrian Lewis, with a 109 average, and continued his form into that weekend by beating James Wade 6–5 to win the first Players Championship event of the year. On his first competitive return to Scotland as world champion, Anderson overcame Kim Huybrechts 7–5 in week seven of the Premier League. He missed double 12 for a nine darter in the last leg. After a 6–6 draw in week nine with Van Barneveld, with a 108 average, Anderson sat third in the Premier League table, with the first round of fixtures completed, and a total of six wins, one draw and 13 points from his first nine matches. After three defeats in his next five matches, Anderson secured his place in the Premier League play-offs with another 7–5 defeat of Phil Taylor in week 14. He finished the regular Premier League season beating Adrian Lewis 7–3 to finish in third. Anderson recorded nine wins, two draws and 20 points from 16 games. He lost 6–4 to Phil Taylor in the final of the ninth Players Championship. Anderson rallied from 7–4 down to Dave Chisnall in the Premier League semi-finals to send the match into a deciding leg in which Chisnall missed three match darts, allowing Anderson to take out a 116 finish to beat him 10–9. Anderson defeated Van Gerwen 11–7 in the final to claim the second Premier League title of his career. He became the second player after Phil Taylor win to the World Championship and Premier League in the same year. Anderson made his World Series of Darts debut at the Dubai Masters, but lost to Phil Taylor at the semi-final stage. Anderson and Peter Wright teamed up at the World Cup of Darts as the number two seeds. After wins over Singapore, Hungary, and Hong Kong, they saw off the Dutch duo of Van Gerwen and Van Barneveld in a doubles match to ensure Scotland would play in their first final in the event. They faced England's Taylor and Lewis and were 2–1 down in the tie, before Anderson beat Taylor 4–1 which meant the winner of Wright against Lewis would claim the title, with Lewis triumphing 4–1. At the World Matchplay, Anderson beat Steve Beaton 10–4 in the first round before a surprise 13–9 second round defeat to Mensur Suljovic, which ended his bid for the Triple Crown. Following the completion of the tournament, Anderson became the world number two for the first time in his career. He won his second Players Championship of the year at the final event by seeing off James Wade 6–2. In the final of the European Championship, Anderson held a 10–7 advantage over Van Gerwen, but lost four legs in a row without getting a dart for the title as he was beaten 11–10. He averaged 104.22 against Mark Webster in the second round of the Grand Slam of Darts, but the Welshman took out 71% of his shots at doubles to defeat Anderson 10–6 and he lost in the same stage of the Players Championship Finals 10–4 to Daryl Gurney. In the defence of his title, Anderson reached the final of the 2016 World Championship without facing any troubles following wins over Andy Boulton, Daryl Gurney, Vincent van der Voort, James Wade and Jelle Klaasen with the loss of just two sets. In the semi-finals, he won 6–0 over Jelle Klaasen with a 107 average and threw a nine-dart finish in the opening set. He played Adrian Lewis in a rematch of the 2011 final and hit a 170 finish in the penultimate leg, before hitting double 12 (the same double which he hit to win his first World Championship) to retain his title with a 7–5 win, a reversal of the scoreline from five years ago. 34 180s were thrown which is a record in a professional match. Anderson became the 11th player to win more than one World Championship and joined Eric Bristow, Raymond van Barneveld and Lewis in being the only players to have successfully defended their first world title. 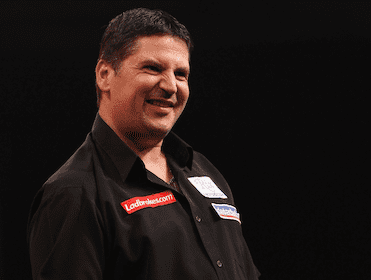 Anderson took the fourth UK Open Qualifier with a 6–1 victory over James Wade, but at the main event suffered a huge surprise fourth round loss as amateur Barry Lynn won 9–3. He finished third in the Premier League to qualify for the semi-finals and rallied from 8–4 down against Phil Taylor to trail by one leg, but would be beaten 10–7. Anderson had an exceptional year in the invitational World Series events as he claimed the Dubai Masters, Auckland Darts Masters and Tokyo Darts Masters. He reached the semi-finals of the World Matchplay for the second time, but lost 17–8 to Taylor. Anderson's second Pro Tour title of 2016 was the 12th Players Championship which he won by edging out Terry Jenkins 6–5. Anderson's first major final after the World Championship came at the World Grand Prix which he got to without dropping more than one set against Jamie Caven, Kyle Anderson, Kim Huybrechts and Raymond van Barneveld. However, he was powerless to stop Michael van Gerwen from capturing the title with a 5–2 win. Anderson was whitewashed 6–0 by Wade in the first round of the European Championship, averaging just 77.40. In his next event, the World Series of Darts Finals, Anderson wore glasses on stage for the first time. He said after going for an eye test he could not believe he had won two world title without being able to see properly and also explained that he has had to change his throw after his old one would knock his glasses off. He did lose 6–5 to Joe Cullen in his first match wearing them, but reached the semi-finals of the Grand Slam where he was defeated 16–14 by Wade. In his quarter-final match with Dave Chisnall at the 2017 World Championship 33 180s were thrown, just one shy of the record. With the match tied at three sets apiece, Chisnall was ahead in the seventh set 2–0, but missed four darts to take it and Anderson would win 5–3. After Peter Wright equalised their semi-final at 3–3 after trailing 3–1, Anderson won nine of the next ten legs to reach the final for the third year in a row with a 6–3 victory. He was on a 17-game unbeaten streak at the event and missed two darts to take a 3–1 lead over Michael van Gerwen in the early stages of the final. Van Gerwen then won 12 of the next 14 legs in taking four sets in a row and, though Anderson pulled one back, his reign as world champion ended with a 7–3 loss. Anderson had not averaged over 100 in his two previous wins in the final, but averaged 104.93 in this defeat, as well as hitting 22 180s which is a record in a single match. The pair smashed the record for the most 180s in a match with 42 and Anderson's 71 for the entire tournament is also a record. Anderson and Van Gerwen also met in the final of the Masters, with Anderson losing 11–7. He was level at 7–7 with Van Gerwen in the semi-finals of the Premier League, before being defeated 10–7. Anderson and Wright suffered a surprise first round 5–2 defeat to Singapore at the World Cup. Originally from Musselburgh, East Lothian, Anderson moved to Eyemouth, Berwickshire, after meeting his ex-wife Rosemary. He presently lives in Burnham on Sea, Somerset, with his partner Rachel. Anderson has three sons: Ryan (22) and Joel (19), the latter of whom lives with his ex-wife Rosemary in Eyemouth; and Tai (born 2014) with his partner Rachel. Gary's brother Stewart died from a heart attack in September 2011, at the age of 35. Shortly after his brother's death, Anderson defeated Mark Dudbridge 6-0 in a PDC Pro Tour event in Derby, averaging 123.5. Anderson's father Gordon died in March 2012. Having previously worked as a builder, Anderson and his partner Rachel moved south to run the Wellington Arms public house in Rooks Bridge, Somerset, for fellow PDC player Steve Grubb. Regulars included former world champions, Trina Gulliver and Mark Webster. Anderson is a supporter of Scottish football side Hibernian. 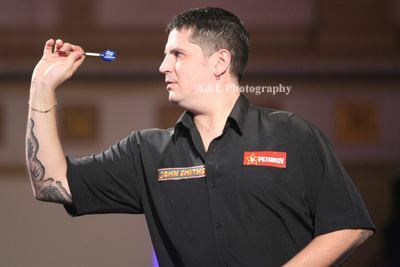 Having initially gone under the moniker 'Dreamboy' earlier in his darts career, Anderson is now known as 'The Flying Scotsman', having adopted the nickname after it was passed on to him by Scottish darts legend Jocky Wilson in 2009. In 2012, Anderson, together with the seven other players who competed in the Premier League recorded a charity single with Chas Hodges and his band called 'Got My Tickets For The Darts' which was written by Chas. It was released on 18 May, the night after the play-offs at the O2 in London, where it was premiered. Proceeds from the single will be donated to the Haven House Children's Hospice.